"BAFTA Awards" redirects here. For the Television Awards, see British Academy Television Awards. For the Games Awards, see British Academy Games Awards. The British Academy of Film and Television Arts or BAFTA Film Awards are presented in an annual award show hosted by the British Academy of Film and Television Arts (BAFTA) to honour the best British and international contributions to film. The ceremonies were initially held at the flagship Odeon cinema in Leicester Square in London, before being held at the Royal Opera House from 2008 to 2016. Since 2017, the ceremony has been held at the Royal Albert Hall in London. The British Academy of Film and Television Arts (BAFTA) was founded in 1947 as The British Film Academy, by David Lean, Alexander Korda, Carol Reed, Charles Laughton, Roger Manvell and others. In 1958, the Academy merged with The Guild of Television Producers and Directors to form The Society of Film and Television, which eventually became The British Academy of Film and Television Arts in 1976. The stated charitable purpose of BAFTA is to "support, develop and promote the art forms of the moving image, by identifying and rewarding excellence, inspiring practitioners, and benefiting the public". In addition to high-profile awards ceremonies, BAFTA runs a year-round programme of educational events, including film screenings and tribute evenings. 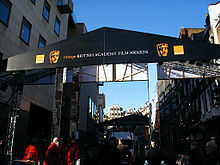 BAFTA is supported by a membership of about 6,000 people from the film, television, and video game industries. The Academy's awards are in the form of a theatrical mask designed by American sculptor Mitzi Cunliffe, in response to a commission from the Guild of Television Producers in 1955. The ceremony previously took place in April or May, but since 2001 it has been held in February in order to precede the Academy Awards. Most of the awards are open to all nationalities, though there are awards for Outstanding British Film and Outstanding Debut by a British Writer, Producer or Director. Only UK films are eligible for the categories of The British Short Film and British Short Animation awards. The Awards ceremony is delayed broadcast on British television the same evening (usually on BBC One), and across the world. In the United States it is shown on BBC America. It has been broadcast in colour since 1970. During each annual ceremony, BAFTA pauses in memoriam to pay tribute to those in the industry who have died over the past 12 months, showcasing a montage of images accompanied by music. The award ceremony is held in London. From 2000 to 2007, the ceremonies took place at the flagship Odeon cinema in Leicester Square. Between 2008 and 2016, the ceremonies took place at the Royal Opera House. The 70th Awards in 2017, and subsequent ceremonies, were held at the Royal Albert Hall. Until 2012, the mobile telephone network Orange sponsored the awards. Orange's parent company, EE, took over the sponsorship of the event from 2013. BAFTA United Nations Award (awarded 1949–1976). ^ "The Outstanding British Contribution to Cinema Award - Awards", The BAFTA site, 6 March 2012. Retrieved 27 August 2012.